The Multi Height Probe combined with the ResTest Test Unit is a great system for use in measuring a wide range of materials and sample sizes when the greater measurement range of the RM3000 Test Unit is not necessary. Constant current source and meter for use in making the four point probe measurement. Displays either sheet resistance or volume resistivity. The probe portion of the system, the Multi Height Probe, comprises a hard anodized aluminum base 25cm wide, 29cm deep and 0.8cm thick. A 19mm diameter stainless steel column 20cm high screwed to the base supports the probe head raising and lowering mechanism incorporating the vertical slide, operating lever shaft, and micro-switch. The vertical slide carries the probe-head, secured by a clamp screw. The probe-head is positioned so that the micro-switch does not pass current until the probes have made contact, lost motion ensures that the current is switched off before the probes are raised. The probe arm can be easily positioned on the vertical shaft to various heights to allow probing onto either flat materials or large or thick materials. For example, a shallow dish containing LN2 could be placed on the base plate and the arm could be positioned to allow the probe to be lowered onto a sample submerged in liquid nitrogen. Materials up to 10″ x 10″ can be positioned under the probe arm (or with a 12″ x 12″ working area for the same price), ingots, and materials that are up to 6″ tall. If necessary, a taller vertical post can be supplied for use in measuring taller items. The Cylindrical probe head, one of which is included with the Multi Height Probe, can withstand temperatures from 77K up to 120C in it’s standard configuration. A modification to the Cylindrical probe will allow it to withstand temperatures from 77K up to 200C in an oven, or up to 300C for short periods of time on a hot chuck. The Multi Height Probe is conservatively limited to 80C, however, temperatures up to 300C using a hot plate are okay if certain precautions are taken. 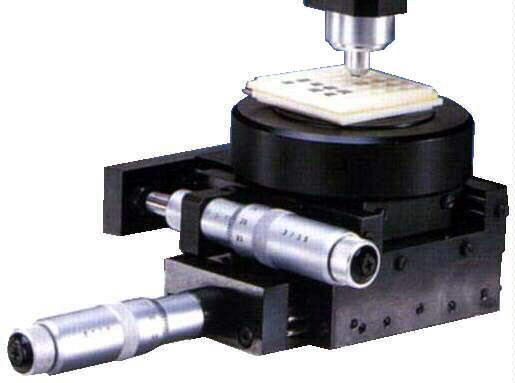 Optionally, at no additional charge, the Multi Height Probe can be supplied with four mounting holes so that it can easily be upgraded in the future to add either 1) the 25mm travel X-Y sample stage with 76mm (~3″) diameter vacuum hold-down sample chuck for use in positioning very small samples under the probe tips, or 2) the 6″ or 8″ wafer stages which can be seen on page 3 of the PDF file mhp+hm21.pdf. When a wafer stage is supplied with the Multi Height Probe, it can be removed for use in measuring other types of materials, however, it does not include the integral light shield which is provided with the Multiposition Wafer Probe systems. The ResTest is a combined constant current source and digital voltmeter, which has been designed specifically for use with a four point probe to produce resistivity and sheet resistance measurements. The unit supplies a constant current and can display resultant voltage sheet resistance and volume resistivity. The ResTest has a large color display and it can read-out in either sheet resistance in the range from 10 milliohms-per-square up to 106 (1 million) ohms-per-square. The range is not as great as the RM3000, however, it is faster and has a larger color display. If you do not require as great a measurement range as the ResTest Test Unit provides, you might be interested in the: Multi Height Probe combined with the HM21 Hand Held Meter. The Multi Height Probe with the RM3000 Test Unit features high accuracy, an excellent range, and many features which simplify the four point probing measurement: Multi Height Probe combined with the RM3000 Test Unit.